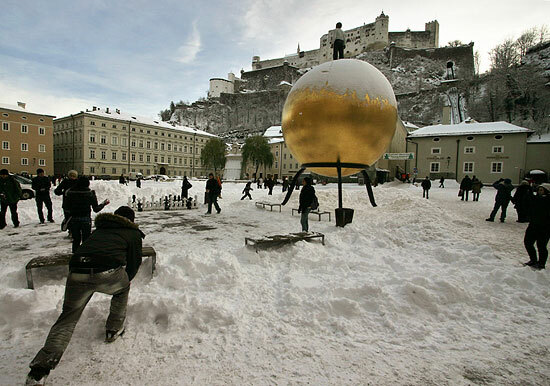 A group of school children is playing in the snow at the Kapitelplatz right next to the Salzburger Dom Cathedral. The building on the left side of the picture is the Erzbischöfliches Palais, the residence of the Archibishop of Salzburg - much more humble than the elaborate Residenz palace around the corner, which the Prince Archbishops used until Salzburg became part of the Habsburg Empire. The golden sphere is a piece of artwork by Stephan Balkenhol. It is supplemented by a woman right next to the Festival Hall (Haus für Mozart) and part of the Salzburg Foundation's effort to add some contemporary art of value to Europe's biggest open-air museum. Note the nice view on Salzburg Castle (Festung Hohensalzburg) in the background.